Insurers have already received $30 million worth of claims from NSW's devastating bushfires and expect that number to increase sharply over coming days. About 550 claims totalling $30 million have been lodged since the fires broke out on Thursday, many for total loss of properties, according to the Insurance Council of Australia. 'We expect this will rise quite sharply over coming days and weeks,' spokesman Campbell Fuller told reporters on Friday. He urged residents in fire-affected areas to lodge their claims as quickly as possible so assessors can prioritise them. 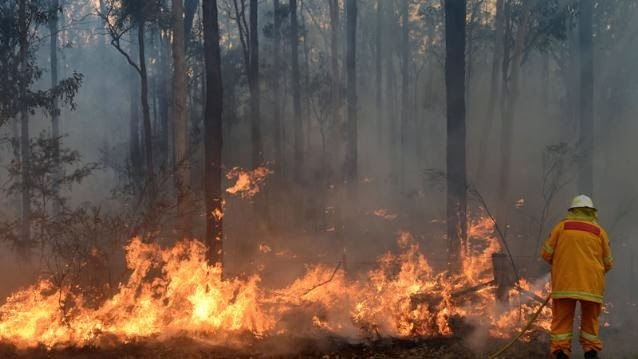 The volume of claims was likely to surpass that from earlier blazes at Coonabarabran and could approach the $89 million total from Tasmania's Dunalley fires in January, he said. Inspectors have been called in from across Australia and are on standby to assess the damage when the fire zones are safe. Residents should also be wary of scammers offering to start rebuilding their homes for a fee, he said.